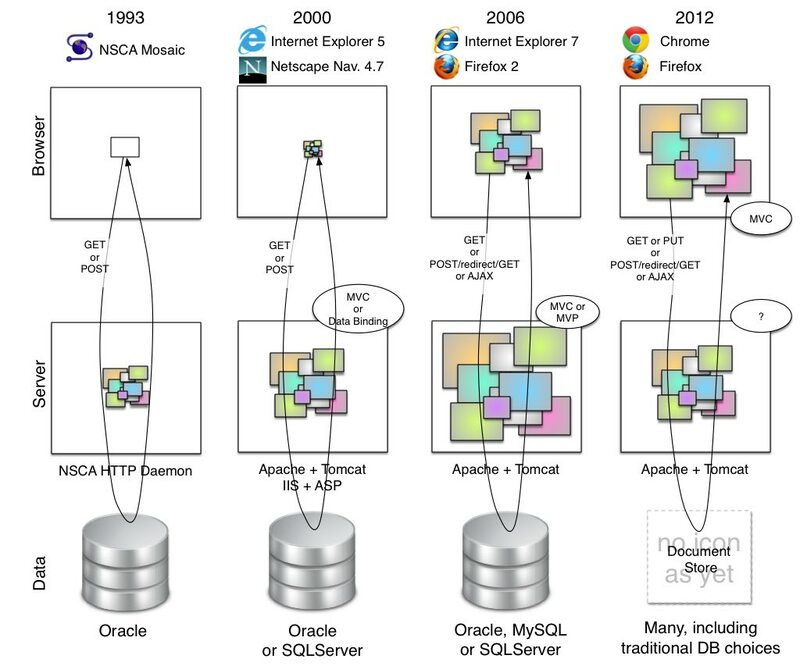 Check out this cool infographic of web development stacks over time. Complexity has increased with different backends, CORS, GraphQL, and other advanced front-end technologies. The server handling the data provision and accepting back the updates is, in fact, a data-store that can speak HTTP and knows about CORS. CouchDB has been around for a long time and is hugely attractive for many reasons. Online, Firebase would be an example too, if you don’t want to own your own data. Both have their own custom over-HTTP wire language that works well for them, and use the HTTP verbs - GET, POST, PUT, DELETE. that easily caters for schema changes over time. by humans. It should supplant REST. GraphQL capable stores could be deployed to host the data, and leave you in a more elegant place than the custom over-HTTP APIs of CouchDB and Firebase. There are some purpose-built adapters for Postgres that allow for a translation between GraphQL and PostGres’ SQL dialect. Those are GraphpostgresQL and PostGraphQL. Again, I’m not deploying logic to those (controllers, etc). Instead, I’m sending requests that conform to GraphQL’s pseudo-functional DSL, and they do the interop with the Postgres database. See also the CouchDB/SVG/Angular/CORS and Firebase/Angular demo apps I made last year. Published at DZone with permission of Paul Hammant . See the original article here.